Famous couples — the world views them with a mixture of curiosity, envy, admiration and awe. No other couple catches ordinary mortals’ attention as the celebrated ones, where neither basks in the reflected glory of the other. Rather each partner shines on his or her own mettle, carries its individual halo of glory and has little fear of being overshadowed or smothered by the attention paid to the other. So if joy shared is doubled, sorrow shared is halved….. ..which law of mathematics does fame shared follow? Does it, a-la Abhimaan, create fissures? Or does it bind spouses with their creativity, acting like an indestructible glue? How do talented couples relate to each other within the confines of the four walls of home? More pertinently, how do they tackle societal expectations? For success might be an aphrodisiac of sorts, between life partners enjoying individual successful lives, but does it act as a dampener or a kindler? 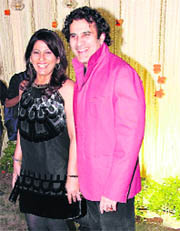 Archana shares that both she and Parmeet have gone that extra mile to keep their marriage growing. While she has learnt to accept his chequered career growth, he has not allowed the typical male chauvinism to stand in the way of her thriving career. Moreover, they do make a conscious effort to spend quality time together or learn things together like enrolling for Art of Living course. Agreed, growing up together and witnessing each other’s struggles; as well as growth, couples are unlikely to be bowled over or rattled by each other’s achievements and milestones. Does creative energy also get a fillip in each other’s company? Are they each other’s best or worst critics? Mumbai-based painter Atul Dodiya agrees that his wife Anju Dodiya, also a prominent artist, is extremely critical of his work. But whether it works well for the family life, he is not sure. 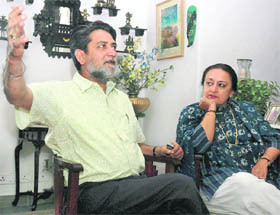 In cases like that of Vivan and Geeta, the artist respects his wife’s judgment, for she is India’s leading critic, who understands his art better than most people. In comparison, he is only a reader of her books and may or may not offer valuable suggestions. With couples like India’s leading lensman Raghu Rai and Gurmeet Rai, a conservation architect, who hail from different professions, the duo do not have enough knowledge of each other’s craft to comment. Does that imply creative couples constantly spur each other towards excellence? Yes and no. Laughs Gurmeet, “Well, if I tell Raghu this project is too difficult and I may not be able to do justice to it, his standard refrain is — don’t take it up then.” Just proves men will be men, never mind, who are the partners in question. And that someone can be the husband, too. Vivan confesses that he is more of a hands-on person, ready to help in household responsibilities. Well, private space might be managed well, each might be more than willing to give the other the much-needed space and freedom and completely empathise with others’ professional commitment, too but, how do these couples cope with the pressures of the prying public eye, especially when one partner could be slightly more famous than the other? Jesse is happy to have Sandip, whose career graph is rising steadily, in the driving seat at the moment. Gurmeet has absolutely no hang-ups about her husband being recognised even by the common man on the street. Being decades younger to him, she finds no reasons to be insecure of the adulation he receives. So, here’s to the power of two that may not change the world but does change the way it perceives success.